Electric operation of Basketball Backstops, Batting Cages, and other devices suspended from the ceiling. Safety Strap for Basketball Backstops and may be adapted to other Ceiling Suspended Devices. 35' Strap is Standard. Manual UP and DOWN operation of Basketball Backstops, (can be used with portable drill with 3/4" square drive adapter. hand Crank is included. 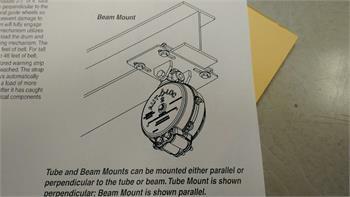 This Beam-Clamp AVAILABLE to attach Aut-O-Loc to I Beam (6"-8" I Beam), if there is NO Pipe to attach too. 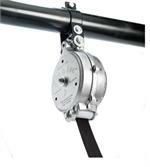 110VAC Electric winch can be operated by a remote key-switch or a wireless hand-held transmitter. Manual winch can be operated by hand-crank or a low speed drill motor. Electric Winch provides a considerable amount of added safety for your staff. Wireless Remote operation, initially more expensive because of the addition of a Remote Receiver, can save a lot of added expense for key-switch wiring.